A happy horse is a happy rider! Marty is an atypical baby-boomer embarking on her third career. Before learning equine body work, Marty learned everything about horse care and western riding at the Las Vegas Riding Academy. A retired U.S. Army Reserve officer, Marty taught middle school full-time for 25 years in New York, Washington, D.C., and Las Vegas. 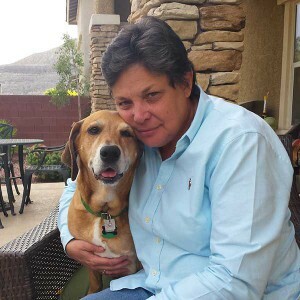 Marty loves animals and has been active in animal rescue and pet therapy for several years. 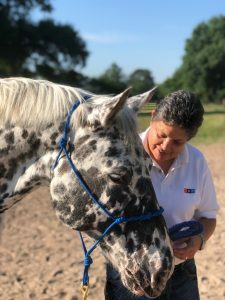 She is currently an English rider at Sonesta Farms in Cypress, Texas, and is an active volunteer massaging the horses at SIRE (Hockley), Houston’s Therapeutic Riding and Horsemanship Program. Why Choose Major’s Horse Massage? The Masterson Method® of Equine Bodywork/Massage is used as a maintenance and preventive therapy to remove restrictions and increase the horse’s range of motion. Marty incorporates gentle touches to relax and communicate with the horse, while assessing the horse’s reactions. The Masterson Method® is a gentle technique which relaxes the horse and helps alleviate soreness, strain, and tension. Marty is committed to patiently and compassionately working with your horse, leaving them feeling better than before.